The concept of Dual-Track Scrum was first evangelized by Marty Cagan back in 2012, and more recently elements of it have been incorporated into Google's Design Sprint. Earlier this year, we wrote about how Dual-Track works from a design perspective, and want to demonstrate how it can be applied in practice. By leveraging Dual-Track Scrum, teams are more focused, reduce their rework and significantly improve their ability to plan while still retaining their agility. In this article, we'll review the benefits of Dual-Track Scrum and show how we implement it in practice using agile tools such as Atlassian's JIRA platform. 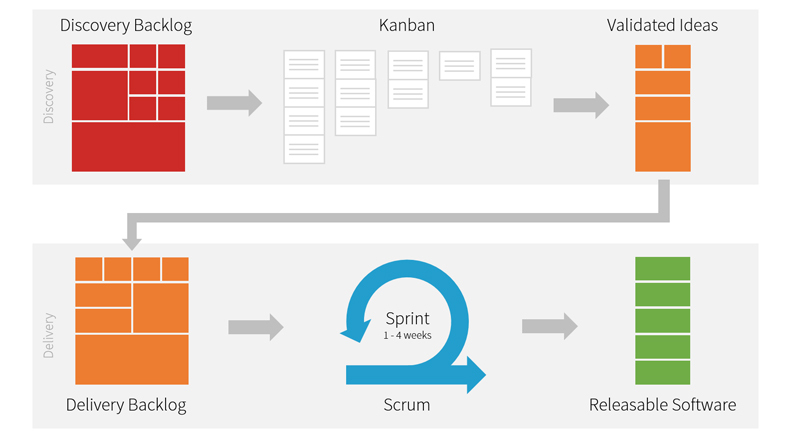 Dual-Track Scrum is an agile organizational model that separates the effort to discover the best solution from the effort to deliver working software. It consists of two tracks of activity: discovery and delivery. The objective of the discovery track is to validate ideas quickly and efficiently, while the objective of the delivery track is to build, test and deploy production-ready code. Ideas are prototyped in the discovery track and the findings are fed into the delivery track. The discovery to delivery process continuously repeats throughout the product's life. Each track has its own team: the discovery team and the delivery team. The discovery team typically contains a small team of lead designers and developers, while the delivery team consists of developers and testers. A Product Owner often oversees the effort of both teams in order to facilitate the flow of work between the teams. A traditional scrum team works by organizing one backlog by business priority. When a new sprint starts, the team takes the highest priority items from the top of the backlog and starts working on them within the sprint. During the sprint, the team needs to agree on the designs, define the technical solution, build the code and test the feature - all before the end of a sprint. This time crunch makes it difficult for teams to design features effectively. Dual-Track alleviates this time crunch by providing a dedicated team tasked with proving designs and prototyping solutions. Unlike a Scrum backlog, Dual-Track backlog items are identified as mature or immature. Immature backlog items are ideas that have not been vetted as valuable by users nor viable by the development team. The discovery team works to research, prototype, and validate immature ideas with users and developers (refer to Google's Design Sprint). They typically operate in a Kanban fashion due to the nature of uncertainty in their work. Once their ideas have been vetted and matured, they are then planned in the delivery team's Scrum backlog. At Devbridge, we use Atlassian's JIRA platform to manage our agile development projects, and we use Dual-Track with JIRA so often that we created a workflow you can download for free from the JIRA marketplace. We hope you find this information helpful on your journey to implement Dual-Track in your organization. If you'd like to learn more about our Dual-Track process or how to accelerate your agile transformation, reach out to us!